Alors aujourd’hui ‘Crashing Heaven’ est lancé en France comme ‘Station: La Chute’. C’est une merveilleuse édition de Denoël, magnifiquement traduite par Florence Dolisi et avec une belle (et très précise) couverture de Manchu. Donc, tout d’abord, bienvenue lecteurs français au monde de Jack Forster, Hugo Fist et tous les autres. Si vous voulez en savoir plus sur le livre et ses inspirations, j’ai fait une interview avec Gromovar Wolfenheir, où nous parlons de tout cela et plus. Et voici ses deux premières critiques françaises, chez Lecture 42 et culturevsnews. Bonne lecture, et encore une fois – bienvenue! First of all, I spent a lot of time just looking at it and being thrilled. 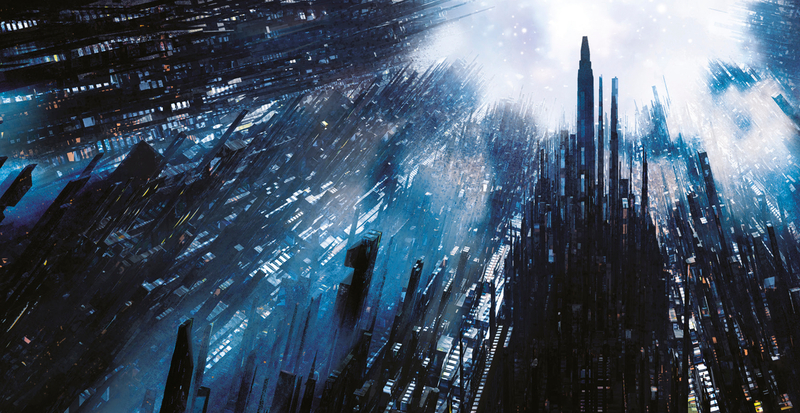 Crashing Heaven’s set on a giant orbital habitat called Station – Dominic’s image captures both its oppressive crush and the numinous light of its gods’ presence beautifully. I found them fascinating. In particular, I was struck by the way that they overlaid the bleakly hostile wastes of space with such a secure, cosy, comfortable world. There was something so very suburban about them. Perhaps humanity’s spacefaring dreams will indeed reach their apotheosis with the recreation of late 20th century dormitory towns around as yet unreachable suns, as yet unimagined planets. And perhaps that’s very natural. Space is deep – far deeper than we can reasonably comprehend. Perhaps some nice drinks with the neighbours on a lovely sward-edged patio, while the buffet steams in the background, are an essential hedge against the cosmos’ punishing, inhuman vastness. They represent the optimum of what people want. There’s a certain sort of logic leading to these immaculate suburbs. And they’re terrifying, because they are the death of the soul. And I thought, My God, this is the prison the planet is being turned into… if you have a world like that, without any kind of real freedom of spirit, the only freedom to be found is in madness. I mean, in a completely sane world, madness is the only freedom. 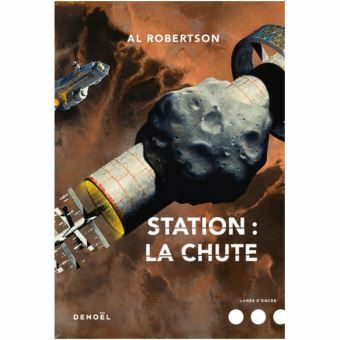 Those two ideas – of a space station as a suburb, and of suburbs as very problematic places – clicked together, becoming a key inspiration for Station. But of course Station’s been continuously occupied for about 700 years. So I started thinking about how it has evolved. Its population has increased. Its economy has grown. Space within it is limited. So, its architects have built upwards. Green space has been lost. Population density has shot up. The shopping malls and business parks and habitation units have metastasized. 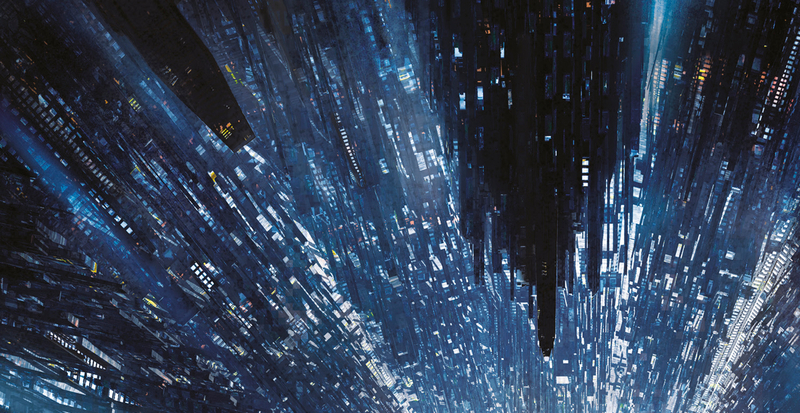 Dominic’s cover art catches that beautifully, across the image as a whole and in every detail. Looking at it I see a fully mature orbital habitat that’s turned right in on itself, going to seed along the way. The physical and psychic repression that Ballard describes has increased to unbearable levels. And so, as always, repression leads to overflow. Crashing Heaven’s heroes – battle-scarred accountant Jack Forster and virtual ventriloquist’s dummy Hugo Fist – are one manifestation of that overflow. In Station terms they’re mad, because they question the corporate gods that rule it. But that madness liberates them, driving them to think the unthinkable and do the undoable. And so, the action of the book begins, leaping straight out of a beautiful cover that captures its mood and setting perfectly and resonates wonderfully with the visions that inspired it. Finally, two links, both with a little more about the cover. Here’s Gollancz’s blog post officially revealing it, and here’s Niall Alexander talking about it over at Tor.com.